Viticoltori De Conciliis is a family affair. It was established in 1996 after siblings Bruno, Luigi, and Paola convinced their father, Alessandro, to transform the family poultry farm into world-class vineyards. It was a visionary idea, as this stretch of coastal Campania known as Cilento (forming the lower “shin” of Italy’s boot) was not particularly prized for wine production at the time. Cilento still remains very much a wild and woodsy region but the volcanic soils, steep slopes, southern exposure, and coastal climate of the De Conciliis estate have proven to create wines of significance – on par or surpassing the quality of the best wines from the better known regions of Campania farther north above the city of Naples. Today, Bruno De Conciliis leads the way at the estate, somehow creating wines that are simultaneously cutting-edge and steeped in the ancient lands they come from. He is an organic winemaker in an Italian region where chemically based farming has been the status quo since the end of the Second World War and he has introduced many biodynamic farming practices to this corner of Italy. 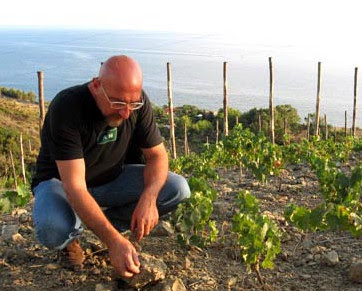 His primary focus is on growing and vinifying Campania’s most noble grape varieties, Fiano (white) and Aglianico (red), with a vibrancy and rich character that many ascribe to his unique, isolated growing sites which lie on land where there has never been any commercial, chemically based agriculture. Bruno is a lover of jazz. His signature wine “Naima” is named after a John Coltrane tune. The 2007 vintage “Naima” is 100% Aglianico fermented with indigenous yeasts and then aged in barriques (one, two, and three-year-old) for a year, large neutral wood barrels for two years, stainless steel for six months, and finally one year in the bottle before release. The result is a wine rich with fruit, redolent of wild berries and herbs, with firm tannins, and a refreshing brightness on the close. This is a wine to pair with a fine hunk of roasted red meat. Only 6,800 bottles were produced. The major ancient Greek city of Paestum and the Cilento represent an area of immense cultural and geographical significance – so much so that in 1998, they were collectively granted UNESCO World Heritage Site status. “Antece” is a 100% Fiano wine that is only made in the best vintages. It is a skin-contact white wine (made like a red wine) that allows it to extract more complex aromatics and textures from the grape skins. After fermentation with indigenous yeasts the wine is aged in large oak barrels for two years and then another year in bottle before release. Intense aromas of peach, pineapple and almond precede an opulent richness before finishing with a long and textured finish. This is a white wine that needs full-flavored seafood like mackerel and tuna or most any preparation of pork. Only 3,500 bottles produced.